Author: Jonathan Thurgood (Northumbria University and University of Dundee), David Pontin (University of Dundee) and James McLaughlin (Northumbria University). Magnetic fields play a key role in determining the dynamics of plasmas at all scales: from fusion experiments and laboratory plasmas to galaxies and accretion disks. For solar physics specifically, their importance cannot be overstated (19 past UKSP nuggests have ‘magnetic’ in the title or description!) Much of our present understanding of reconnection has focused primarily on continuously driven (and hence at least quasi-steady) systems, while transient effects that are crucial in many plasma environments are typically neglected (though there are important exceptions). Furthermore, the study of 3D effects is still relatively uncharted territory. Combined with questions regarding the influence of chosen boundary conditions, the applicability of any given reconnection model to a particular solar case is often unclear. In our recent research, we have instead been studying the self-consistent formation and evolution of reconnection regions (current sheets) near different types of null points in response to finite energy perturbations in the form of MHD waves, isolated from the boundary effects. We typically find that the resulting evolution is characterised by phenomena which may be of importance for solar atmospheric dynamics. In this nugget, we present a case study which illustrates this typical behaviour. Figure 1. (a) Equilibrium magnetic field. Black field lines illustrate the behavior of the spine and fan field lines, where the fan field lines point radially away from the null in the z = 0 (fan) plane and the spine line points toward the null along the z-axis. Red field lines are traced from above the fan, and blue from below. (b) Representative perturbing flux ring, superimposed upon the background field. Coloured isosurfaces profile the increasing perturbation field strength from zero (transparent) through weak (blue) to strong (red). The circulation of flux ring field lines in planes of fixed y is illustrated by the yellow line. 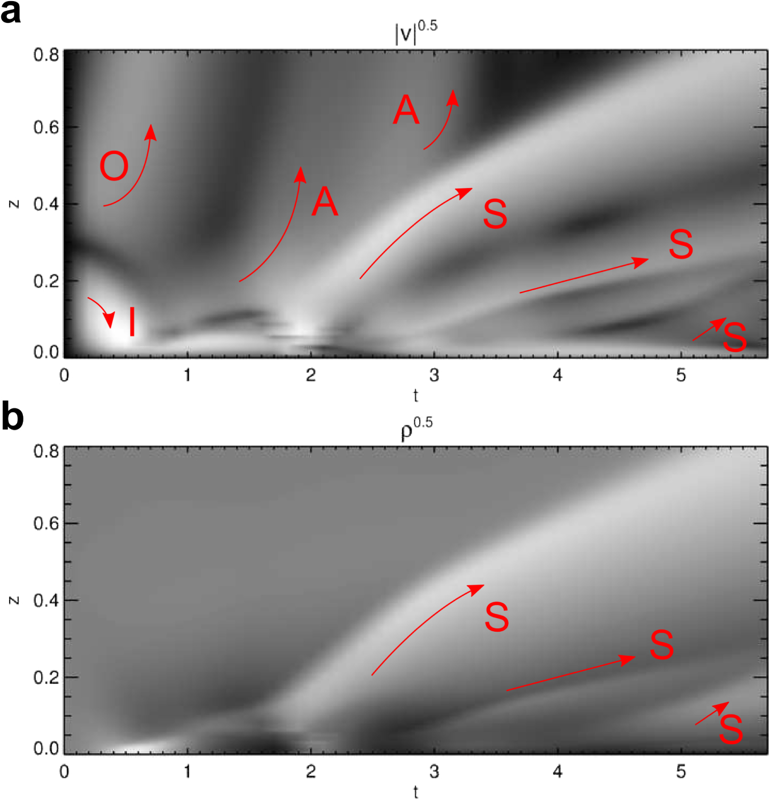 We outline the dynamic evolution of localised and finitely-driven reconnection regions about fully-3D magnetic null points using numerical simulation of resistive, single-fluid MHD with the code Lare3d. For the case study we consider a null of the form B = [x,y,-2z] (a so-called k=1 or azimuthal symmetric potential null). We subject the null to a flux-ring-like perturbation which corresponds to a (finite), nearly-uniform current distribution about the null which is localised in all three dimensions ( for details). The presumed physical origin of this perturbation is that of an accumulation of externally originating MHD waves impinging upon the null. This is a generic, well-studied phenomenon  that is known to evolve towards this state (i.e. our initial condition is a justified modelling simplification). Figure 2.Transparent isosurfaces illustrating 3D distribution of current J about the collapsed field close to the null at (a) t = 0.1 and (b) t = 0.5 (close to where the implosion stalls). Note the changing colour scales. The perturbation disrupts force-balance at the null and propagates inwards as a fast wave. It participates in an implosive process (null collapse) whereby energy is focused in increasingly small-scales towards the null. The precise behaviour of the implosion depends on the ability of the wave (its free energy) to continue to nonlinearly self- focus relative to plasma back-pressure and resistive diffusion, which both increase as plasma is increasingly compressed and current concentrations grow. Eventually, the process is halted due to a combination of these effects. The physics of this implosion is well-understood in the context of 1D harris sheets and 2D null points . We have found that most aspects of 2D null collapse carry-over to various 3D nulls , and have derived empirical scaling relations and compared them to a reduced 1D analytical solution . Here we choose parameters that correspond to a perturbation of sufficient energy to nonlinearly form a current sheet which is well-resolved on the grid at the time the collapse stalls. A representative current sheet evolution is shown in Figure 2, and the system of flow through the sheet at the halting time is shown in Figure 3. We stress that the sheet is localised in that it is detached from the influence of the boundary conditions and is not subject to continuous driving flows. The shock structure around the jets is a Petschek-like system – replete with a collimated jet bound by standing slow shocks and fast termination shocks – as confirmed by detailed analysis of the jump conditions in . Figure 3. Reconnection jet at t = 0.7. (a) The system of flow in the y = 0 plane, where the colour map illustrates density, blue curves are magnetic field lines in the outflow regions, and red curves are field lines in the inflow regions (with the inflow and outflow regions separated by the spine and fan). Black velocity arrows indicate flow direction and magnitude. The dashed white contour encloses the region of super-magnetosonic flow. (b) The system of flow out of the y = 0 plane, where density enhancement and velocity arrows are instead shown in the plane defined by the current sheet’s lengthwise axis. The transparent yellow surface encloses the super-magnetosonic jet. We can see that the acceleration of plasma is predominantly confined along the current sheet length, with limited out-of-plane effects, which is consistent with the directionality of spine-fan reconnection shown in Figure 4. Figure 4. Reconnection of two thin flux tubes that are initially symmetric about either side of the initial current sheet. The time t≾2.2 spans the first reconnection event (positive current at the null), where field lines anchored above and below the null (i.e., at larger z) flip around the spine, and field lines anchored closer to the fan plane (i.e., at lower z) flip up the spine, thus being transferred through the fan plane. This connectivity change is spine-fan reconnection. By the completion of the first current sheet reversal, the selected flux tubes have bifurcated into four separate tubes. The later time follows them through the second reversal. The exterior flux tubes do not participate in the second reconnection event and are so recolored a transparent gray for clarity. The interior flux ropes are again reconnected in the spine-fan mode, but in the opposite direction to the initial reconnection because of the current reversal. As the outflow evolves, we observe the pooling of hot over-dense plasma at the heads of the reconnection jets, leading to back-pressures that choke off the outflow. This is accompanied by the relief of compression in the current sheet itself via the expulsion of the excess plasma. A plasma rarefaction forms in the inflow lobes, with plasma accelerated through the current sheet unreplenished in the absence of continual driving flows. The consequence of this plasma and flux redistribution is that the balance of forces acting across the spine and fan planes (the collapse of which is necessary to sustain the reconnection and current sheet) must change as reconnection proceeds. The competition of these effects sets up secondary, oppositely-directed null point collapses which leads to successive changes of the current sheet orientation and polarity (‘reconnection reversals’ or ‘current sheet reversals’). Naturally, the concomitant reconnection also reverses its directionality – thus we have time-dependent, periodically-reversing reconnection, i.e. 3D oscillatory reconnection (OR) . We find that in 3D OR, the magnetic reconnection is of the spine-fan type (multiple types of reconnection are permitted in 3D as per ) as visualised in Figure 4. Figure 5. Time-distance diagrams showing the evolution of (a) velocity magnitude |v| and (b) density ρ along the z-axis (the approximate position of the spine away from the collapse). The intensity of both quantities is scaled as the square-root to enhance contrast between different features. In these simulations the reconnection only occurs in a small region near the null point. However, the global effects of the magnetic field restructuring are not artificially confined to this area by computational boundaries, but rather may escape the vicinity of the current layer as freely-propagating waves. We find many escaping MHD waves are generated and highlight a selection in Figure 5. The time-distance diagrams for velocity and density signal along the spine axis are consistent with the intermittent launching of Alfvén (A) and Slow (S) waves at each reversal. The Alfvén waves manifest as propagating, counter-rotational vorticity tubes, and slow waves are large-amplitude, anharmonic pulses which propagate mass away from the reconnection jets along the spine and fan field lines (see ). Fast wave pulses (potentially shocks) are also ejected from the edge of the current sheet after each successive reversal (see ). The above case-study is typical of our findings, where the evolution is characterised by: (1) reconnection that is time-dependent and periodic (exhibits oscillatory reconnection) and (2) the periodic generation of propagating MHD waves in a variety of modes that escape from the vicinity of the reconnection site. The direct production of observable periodic phenomena by inherently time-dependent reconnection is a tantalising prospect for unexplained periodicities in solar physics that are associated with reconnection events, such as QPPs in flares (see ). However, this is currently largely untested. Whilst we now have a good handle on the quantitative aspects of the initial current sheet properties, OR systems are naturally nonlinear and produce periodicities dependent on multiple parameters. Despite the difficulties, constraining the range of possible periodicities produced by OR under solar conditions and comparing them to observation is a necessary future direction of research in OR. The authors acknowledge generous support from the Leverhulme Trust, and this work was funded by a Leverhulme Trust Research Project Grant: RPG-2015-075. The authors acknowledge IDL support provided by STFC. The computational work for this paper was carried out on HPC facilities provided by the Faculty of Engineering and Environment, Northumbria University, UK.